The Producer 8300N provides ultimate throughput, full-blown networking, and ‘hands-off’ operation. It is more robust and feature-filled, for demanding environments. Includes four recorders and embedded PC. 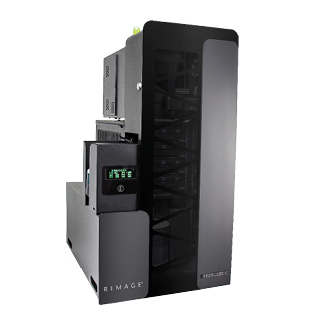 Features the Everest™ Encore printer as standard on all units or you can choose the Rimage Prism Thermal Transfer Printer. Includes Rimage Software Suite. CD Designer, QuickDisc, System Manager, WebRSM, Rapid API, Web Services. •Data-Merging Flexibility using proprietary architecture that supports multiple unique data streams allowing concurrent network downloading, imaging and recording in a single unit. •Photo-Realistic Images using Rimage’s patented Everest™ printing technology-a groundbreaking thermal-retransfer system that redefines the industry standard. •Economical production design makes fast turnaround of short-run projects no problem. •User-Friendly network-based interface makes producing a CD or DVD as easy as printing a document. 8300N – Includes embedded Network PC. Supported Operating Systems Embedded PC installed with Windows 10. Printers Everest Photo-Realistic Full Color Thermal Re-Transfer Printer (Detailed specifications on the printer are available.) or Prism Thermal Transfer Printer. Ribbons 3-color (CMY) panel ribbon; monochrome black ribbon. The Imaging Server Software can create ISO 9660 images (Level 1; Level 1, Relaxed; Level 2, Joliet). Macintosh HFS, Hybrid ISO 9660/HFS and ISO 9660 with Apple® Extensions images. Bin Capacities Four 100-disc bins configurable as input, output, or reject. Maximum I/O capacity is 400 discs. Operating Temperature 60ºF-86ºF (15.5ºC-30ºC). Limited by recorder. Service Options Various Rimage Service Programs are available.